Force of Nature is the perfect follow up to Harper’s first novel The Dry, continuing the investigations of her protagonist Aaron Falk. Whilst it’s really easy to compare follow up novels to their proceeding story, I do think it’s a little unfair to do this as the two stories are so -different- in what they stand for. I loved The Dry and I loved Force of Nature, as well, but for entirely different reasons. The Dry, which narrowly missed out on being on my Top 10 of 2017 list, was always going to be a book that had a lot to live up to but I’m so happy (and slightly relieved, if I’m totally honest) to reveal that I loved Force of Nature just as much. Force of Nature focuses its attention on the disappearance of Alice, a hardworking, robust and often mean-spirited woman who is taking part on a corporate retreat in an Australian nature reserve. The whole concept definitely doesn’t sound like my idea of a good time, but there you go. Alice, along with 4 other women who work for her company, find themselves camping and travelling through a reserve that is known for being a place where people have vanished in the past, either never to be seen again or revealed to be murdered by renowned serial killer. As we slowly learn the details that lead to her disappearance through the eyes of the women, we also join Falk and his colleague Carmen in discovering what happened to Alice. The dynamics and relationships between the different characters are clearly flawed from the start – what is supposed to be a retreat to form stronger relations and repair disputes quickly turns into a trip full of even more anger and resentment. You find yourself, as the reader, forming very strong opinions about each character and it’s easy to see why things didn’t go as smoothly as the organisers of the retreat had hoped. The novel came together oh-so-beautifully in the end. This is one of those novels that ended without any plot holes, and everything was resolved with seemingly no questions left lying. 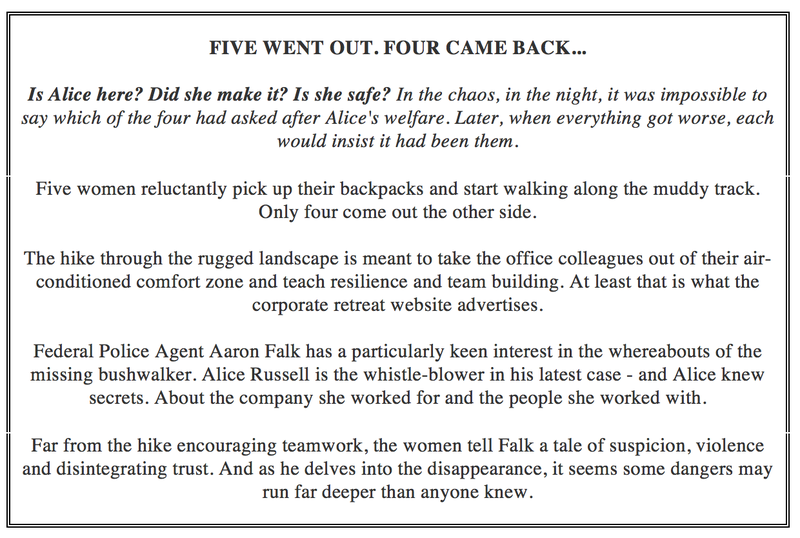 Each clue that led to the conclusion was dangled so subtly that it was impossible to see past and I have to admit that I finished the book having had no idea at all about what had happened to Alice until it slapped me in the face. I love being able to figure out what has happened before the denouement comes together, but having that air of mystery and leaving the reader completely perplexed is a quality that only becomes the most intricately clever of psychological thrillers. I am, once again, incredibly excited to see what Jane Harper comes up with next. I’ll be awaiting her next novel with anticipation! Force of Nature is now available to purchase from the usual places, in both hardback and in ebook form. I’d like to thank Grace Vincent for my advanced copy of the book, and Kimberley Nyamhondera for allowing me to take part in the blog tour this time around!